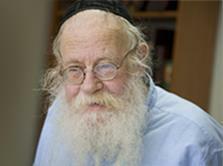 Rabbi Steinsaltz was born in the Hebrew year 5797 (1937), in Jerusalem. He spent most of his childhood and adolescence in the Old Katamon neighborhood as an only child of an idealistic, yet far from religiously-observant family. It was there that he was first acquainted with two of his great influences: Rabbi Abraham Chen, and the late Rabbi Dov Eliazarov z”l. During his high school years, as well as in his undergraduate years studying chemistry and physics at the Hebrew University of Jerusalem, he dedicated most of his time to Jewish studies, from the pshat (raw text) through the sod (hidden meanings). During that time, he met and spent many hours with Rabbi Shmaryahu Sasonkin and the late Rabbi Shlomo Zavin. Thanks to their guidance, he studied for a brief time at the Chabad Yeshiva in Lod. During the following years, he was active in many areas. He began writing for a variety of publications, giving lectures, teaching lessons and conducting educational activities with teens. At the age of 24, he became the youngest high school principal in Israel. In 1965, he founded The Israel Institute for Talmudic Publications in Jerusalem, and began dedicating himself to what would become his life’s work: the translation of and commentary on the Babylonian Talmud. Also in 1965, Rabbi Steinsaltz married his wife, Sara. Today, they are blessed with eighteen grandchildren from their three children. The accurate translation, the elucidating commentary in a fluid modern Hebrew, the diagrams and illustrations, explanations and introductions, biographical profiles of the Sages, extensive supplementary notes and detailed indices – all these have made the Talmud open and accessible to all with the Steinsaltz Hebrew Talmud. Lay readers craved knowledge that was previously unavailable until this version of the Talmud was released. "The Steinsaltz Talmud” books were translated to many European languages, and they play a key role in modern Judaism, as well as in academia. The labor of translation and commentary was completed in 2010 - a forty-five year process. In tandem with the intensive task of commentating on the Talmud, Rabbi Steinsaltz authored more than eighty additional books. His books embrace diverse areas of Jewish knowledge, such as mystical thought, and the Hasidic movement. Some examples include: The Thirteen-Petaled Rose, an introduction to Kabbalah, Translation of the Tanya, the seminal book for Chabad thought, The Introduction to the Talmud and The Guide to Talmud. Books authored by Rabbi Steinsaltz were translated into English, French, Russian, Spanish, Italian, German, Portuguese and even Chinese. In 1992, the Rabbi changed his surname to "Even Israel” as guided by the Lubavitcher Rebbe, of righteous memory. Makor Chaim institutions in and near Jerusalem: Educational institutions for students of middle school and high school, teaching Torah and general studies inspired by the educational worldview of the Rabbi. Makor Chaim Russia: A network of educational institutions for the Jewish community in the former USSR, including the first yeshiva formally acknowledged by the authorities (in 1989, prior to the fall of the Soviet Union), a Jewish university and a training school for preschool and elementary school teachers. An army yeshiva (Yeshivat Hesder) in Tekoa, Israel (founded in 1999) whose students and alumni engage in public activities and community involvement in Israel and in the Diaspora. The Steinsaltz Center for Jewish Knowledge. Established in 2006 in Jerusalem, the Center is the umbrella organization for the educational activities, housing the lectures and workshops given by the Rabbi and his students, the Israel Institute for Talmudic Publications and administration. The Rabbi and his activities are a source of inspiration for Jews and non-Jews around the world, so much so that a private supporting organization was founded by people inspired by the Rabbi, in order to promote his work worldwide. They established an organization called The Aleph Society, operating in the US, UK, Australia and Israel to support the activities of the Rabbi’s institutions and spread his vision. Honorary doctorate degrees from Bar Ilan University and Ben Gurion University of the Negev in Israel, and Yeshiva University, Brandeis University, and Florida International University in the US. The Rabbi has taught lessons and given lectures worldwide. His articles and books are continually published in additional languages. More recently, the Rabbi has been publishing thought pieces on his blog, answering online questions from around the world, and continuing to search for new ways and opportunities to spread Jewish wisdom to broad audiences.